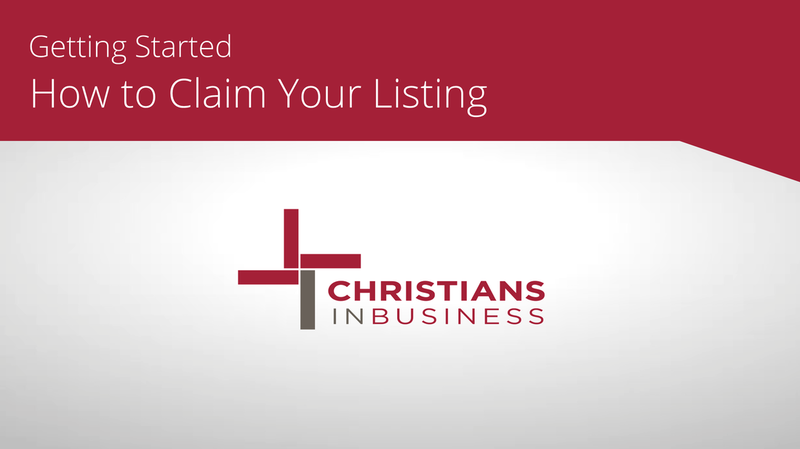 Step 1 - Click on "Claim Your Listing"
​You may wonder how your business information is already in Christians in Business. Many business owners signed up to be included in their own churches business directory, and as a result, their information was automatically entered into Christians In Business. At this point, you will need to enter in this box, the email address you used to sign up for your church directory. If your email address is in our database, you will see this message telling you to check your email. You may need to try more than one email address if you don’t remember which email address you used in your church directory. ​Now, go to your email and click on this link. For the purpose of this training, we will assume that you do not have an account, so you will click the button on the right hand side. When this page appears, simply type in your name and email address, confirm your email address, create a password, and confirm your password. You will need to prove you are not a computer by typing the letters you see here . . . accept the terms and conditions and click the Register Now button. Step 5 - Click on "I do not have an account, let me create one"
​Once registered, you will be taken to the “My Account” page where your business information can be updated and changed whenever you like. All you need to do is click on the “Edit Listing” button and you are now ready to add or change any information in your Christians In Business Profile. Step 7 - Click on "Edit Listing"
Step 8 - Congratulations! You can now start editing Your Listing.